“Snow White is the fairest of them all,” says the evil queen’s mirror in Snow White. In Chaucer’s Canterbury Tales, a mirror displays happenings in the realm. The Mirror of Erised in J.K. Rowling’s Harry Potter books reveals a person’s deepest desires. The Mirror of Galadrial in J.R.R. Tolkien’s fantasy displays the past, present and possibilities for the future. While these accounts are fictional, the black mirror has been used for developing clairvoyance and divining the future for centuries. 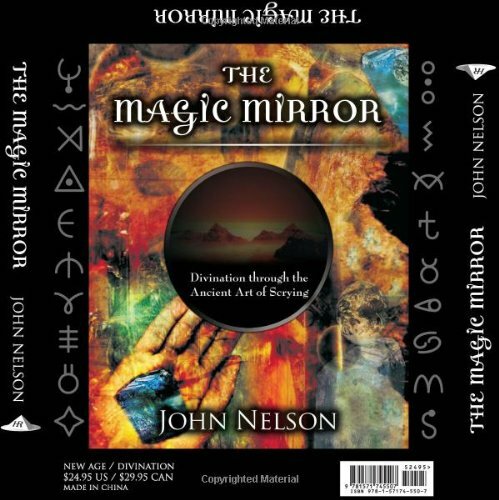 John Nelson has reinterpreted spiritual and metaphysical concepts to make them more accessible to today’s reader. You will learn the origins and history of scrying, how to develop clairvoyant powers and how you can benefit from scrying. Traditional rituals and interpretation are juxtaposed with modern-day psychological explanations. You, too, can have a magic mirror. What will your mirror reflect? The Magic Mirror comes in a gift box including a book, your own scrying mirror, and a CD with instructions on mastering the ancient art of scrying. Now with a foreword by Barbara Hand Clow, author of The Alchemy of Nine Dimensions.